The two-ascender "frog" is a sit-stand system. 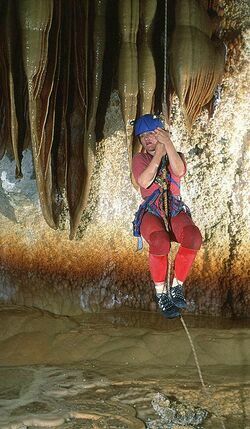 It is the most widely used among cavers worldwide. Single Rope Technique (SRT) is a set of methods used to descend and ascend vertical ropes. SRT is used in caving, potholing, rock climbing, rope rescue, roped access for building maintenance and by arborists for tree climbing. Descent (abseiling or rappeling) uses various forms of friction brake to control speed. The most commonly used are the Petzl "stop" (self-locking) and "bobbin", and four or five bar "racks". For safe SRT, especially on drops with complex rigging with intermediate belays, it is essential that the abseiling device can be removed from the rope without being unclipped from the user's harness. For ascent ("prussiking" or "jugging"), cammed devices ("ascenders") are used that can be pushed up the rope but that lock and hold the user's weight when a downward force is applied; these must also be easily removable from the rope without being detached from the user. Knots such as the Prusik, Bachmann and Klemheist are used to ascend ropes in emergencies in climbing and mountaineering; they have ceased to be the primary ascent method because ice or mud greatly reduce their efficacy. "Sit-stand" systems, in which one ascender is at chest level and attached to the user's sit-harness, and another carries a long loop for the feet. Movement up the rope is by repeated moving of the foot-loop ascender up the rope, pushing up with both feet together, and sitting, supported by the chest ascender. The chest ascender is often of a special pattern allowing it to lie flat on the chest (e.g. the Peztl "croll"). "Rope-walking" systems, with one ascender attached directly to one foot, and another, roughly at chest level, attached to the other foot by a rope; some systems also include a chest ascender attached to the harness. Movement up the rope is by alternate stepping movements with the feet. Most cavers worldwide favour the sit-stand method, and make extensive use of complex rope rigging with intermediate belays and "deviations", so that the rope nowhere rubs against the rock, and to avoid hazards such as loose rocks and waterfalls. Many cavers in the southeastern USA favour rope-walking systems, and have traditionally used simple rope rigging, with the rope belayed only at the top of the drop (the "indestructible rope technique"). Modern SRT uses specialised devices for both descent and ascent, and low-stretch kernmantel rope of 8 mm-11 mm diameter. Other essential items of a personal SRT set are a sit harness and one or more safety cords ("cows-tails") terminated in karabiners, for temporary attachment to safety ropes at the heads of drops and used in manoeuvres at intermediate rope belays. This page was last edited on 7 January 2014, at 21:29.